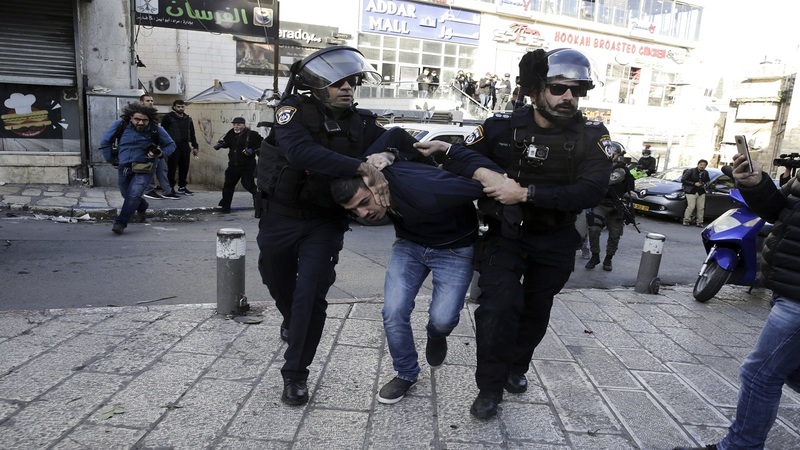 Israel police arrest a Palestinian during a protest against U.S. President Donald Trump's decision to recognize Jerusalem as the capital of Israel in Jerusalem, Saturday, Dec.9, 2017. In speech after speech, Arab foreign ministers kicked off an emergency meeting in the Egyptian capital Saturday with scathing criticism of President Donald Trump's decision to recognize Jerusalem as Israel's capital, but with few ideas on concrete actions to counter Washington's move. The Arab League meeting, which brings together foreign ministers from member states, is taking place as protests continued for the third consecutive day in the West Bank and Gaza Strip. In Cairo, the head of Egypt's largest Christian church announced that he would not meet U.S. Vice President Mike Pence when he visits Cairo Dec. 20, mirroring a decision Friday by the head of al-Azhar, Sunni Islam's top seat of learning. Trump's announcement on Jerusalem, and his intention to move the U.S. Embassy there, triggered denunciations from around the world, with even close allies suggesting he had needlessly stirred more conflict in an already volatile region. The city's status lies at the core of the Israeli-Palestinians conflict, and Trump's move was widely perceived as siding with Israel. 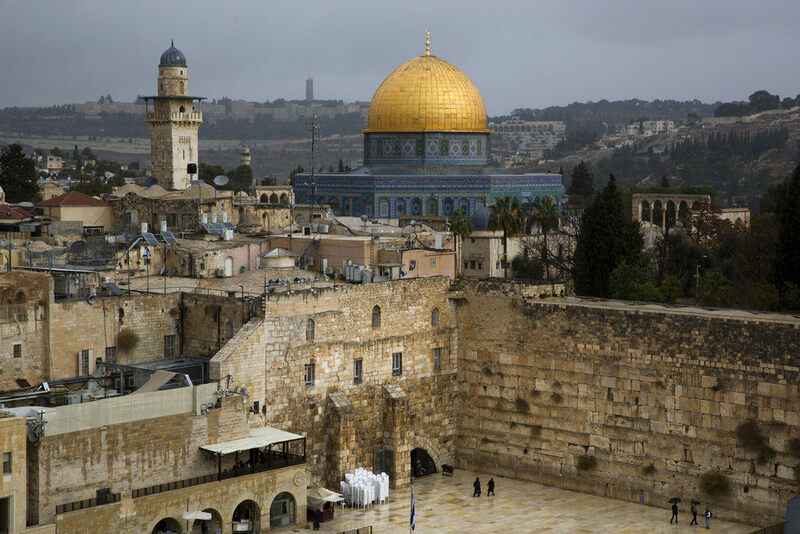 Even small crises over Jerusalem's status and that of the holy sites in its ancient Old City have sparked deadly bloodshed in the past. The Cairo meeting's televised public session began at 9 p.m. local and ended 2 ½ hours later after nearly 20 chief delegates spoke. Their comments ranged from blasting Trump's decision to the need for concrete action to musings on whether fiery speeches would change anything. 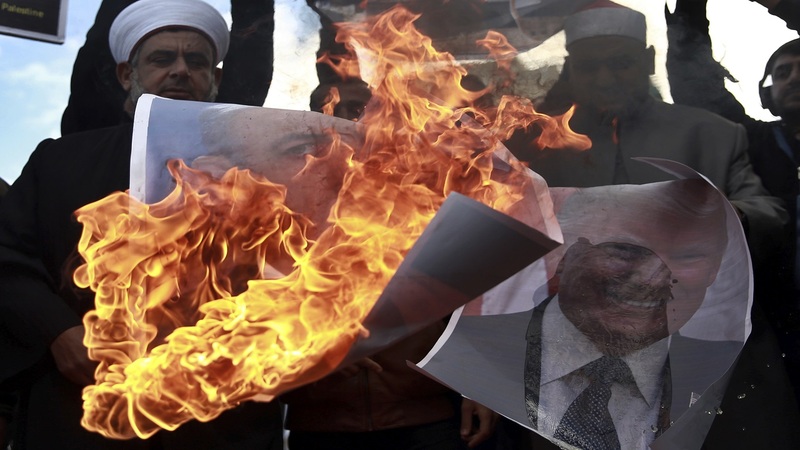 "If we do nothing about this one (Trump's decision), there will be many, many more tragedies," warned Iraq's foreign minister, Ibrahim al-Jaafari. "No normalization (with Israel) and no compromises." 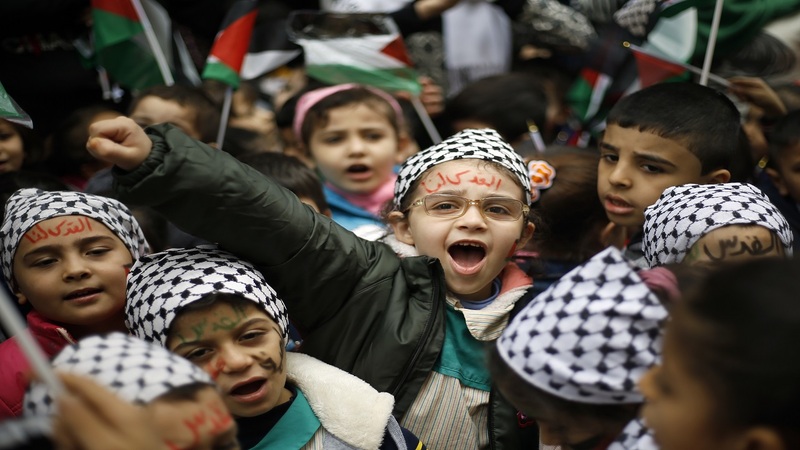 Lebanon's foreign minister, Gibran Bassil, suggested that there might be a silver lining in the latest crisis to hit an Arab world locked in conflict with Israel for nearly 70 years. Earlier, Arab League chief Ahmed Aboul-Gheit and Palestinian Foreign Minister Riyad Al-Maliki called on world nations to recognize the State of Palestine with east Jerusalem as its capital in response to Trump's decision. Aboul-Gheit said Trump's decision "condemned" the country that took it and the administration that passed it. It also raised a question mark over Washington's role as a peace mediator, not just in the Middle East but in the entire world. Al-Maliki called on the league to instruct its envoys in the United Nations to submit a draft resolution to the U.N. Security Council condemning Trump's decision. Trump's decision, he said, "betrays its hostility and bias against the Palestinian people."